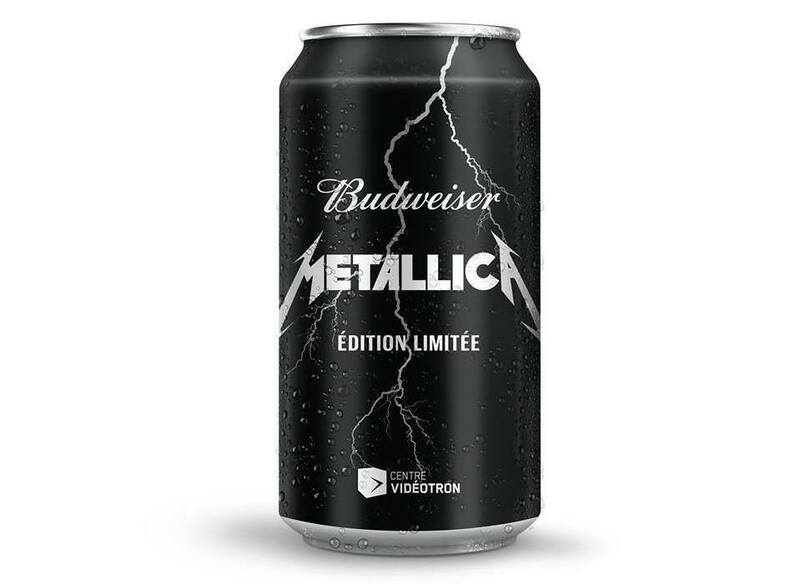 ... And Beer For All: Budweiser Makes A Metallica Beer In Canada : The Two-Way The beer, which has the tag line "Coulée dans le rock" (cast in rock), will get a wider release in Canada later this month when fewer than 100,000 cases of special-edition black cans hit shelves. A limited-edition run of "Budweiser infused with Metallica" will be released in Quebec, Canada, on Sept. 28. Rock fans who are going to Metallica's concert in Quebec City Wednesday will see an unusual sight: a 48-foot tanker truck filled with Metallica-branded beer. Made at the Labatt facility, the beer is to commemorate the band as it opens a large new venue, the Centre Vidéotron. The beer, which has the tag line "Coulée dans le rock" (cast in rock), will get a wider release in Canada later this month, when fewer than 100,000 cases of the special-edition black cans hit store shelves in Quebec. Labatt is the Canadian subsidiary of Anheuser-Busch InBev, the Brazilian-Belgian beer giant. It seems that the Metallica beer won't be much different from the normal red-canned Budweiser. A release from the beer-maker says, "During the concert, the sonic vibrations from Metallica's music will be infused into the liquid, creating the rock and roll recipe." An image posted by the concert venue shows the tanker truck preparing to be infused. Budweiser's plan then calls for the beer to be canned back at the plant and to go on sale on Sept. 28. The members of Metallica have a long-standing relationship with alcohol, having acknowledged drinking before, during and after shows back when they burst onto the music scene — even earning the nickname Alcohollica shortly after their debut album Kill 'Em All in 1983, as Metal Injection reports. Since then, the band has reportedly toned it down a bit. Drummer and founding member Lars Ulrich spoke last summer about perhaps having a glass of Champagne after a particularly big show. But Ulrich still has standards: The Mirror reported that he "has banned One Direction and raised his kids on Black Sabbath and ACDC."